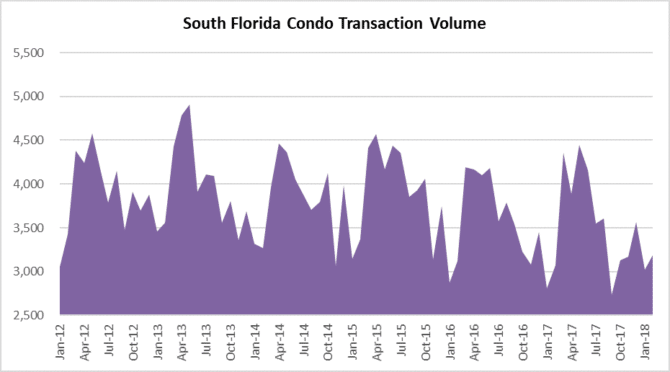 The South Florida condo market appears to be crossing a crucial line in the sand. During the month of February, the number of condos listed for sale reached 31,137. That surpassed the recent high of 31,055 condos listed for sale in February of 2017. Prior to that, we have to look back to June of 2011 when condo inventory was at 31,398. That was after the financial crisis when the market was flooded with distressed properties. Take a look at the red line in this chart below. Basically, if this inventory doesn’t sell during the spring, it will continue to build toward crisis levels. Is it time to lower the tower cranes in South Florida? This chart shows the condo inventory without single-family homes. Is it time to panic? 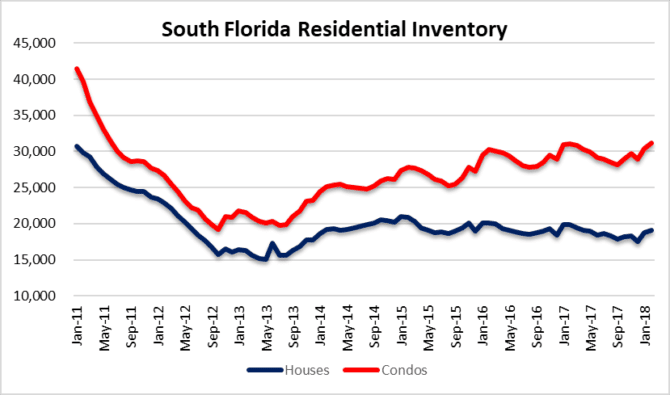 Miami-Dade, Broward and Palm Beach County just surpassed the recent high set last February in condo inventory for sale. 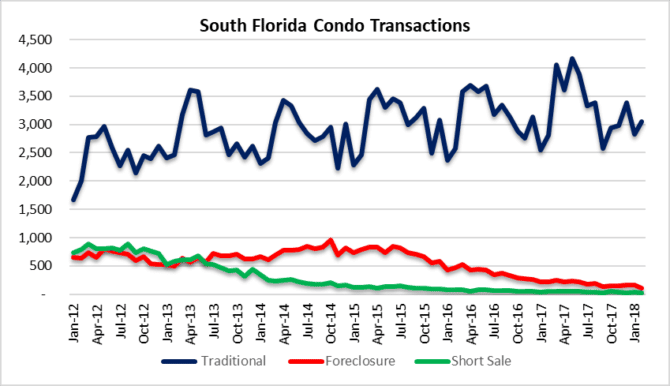 Here is a chart showing the types of condo transactions closing. In February there were 3,188 closed sales, up slightly from 3,023 in January. And here is a snapshot of the combined deal volume. You will notice that there was a strong buying spree last winter and spring. 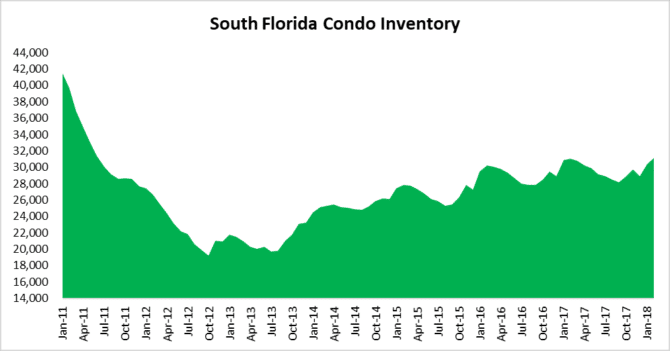 Last March, April and may were big months for the South Florida condo market. Will that enthusiasm return this year? Builders are hoping it does, if not you will continue to see inventory of unsold condos grow and prices will begin to suffer. The condo market is on the main stage and we are all watching to see if it flips or flops. Although many speculators and investors pay cash, there are still plenty of buyers relying on mortgage financing. Have you checked mortgage rates lately? Here is a quick link to Bankrate with some excellent mortgage tools for buyers in the market for a loan. They have the latest rates offered by lenders and some nifty calculators as well! 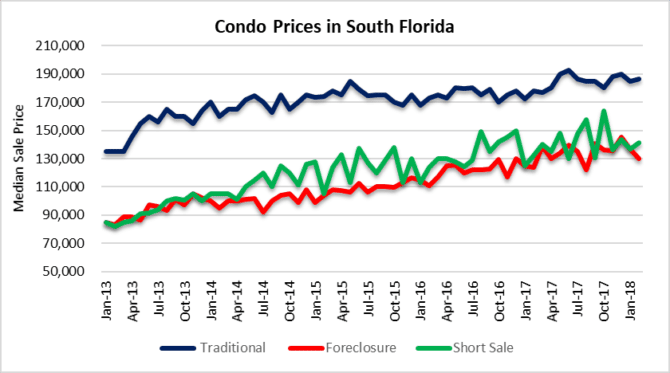 This entry was posted in Condo market, Fort Lauderdale real estate, Market Insight, Miami real estate, Palm Beach real estate, South Florida Real Estate and tagged condo prices, housing bubble, mortgage rates. Bookmark the permalink. Both comments and trackbacks are currently closed.